Distribution : Western Indian Ocean. All over the mantle are small translucent pits each with a golden-yellow spot giving the mantle an uneven pitted appearance. 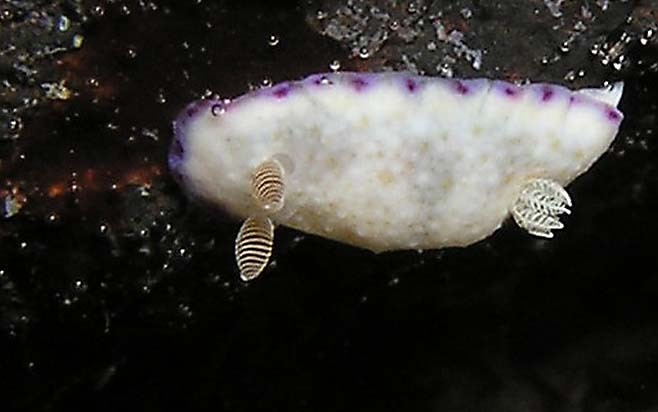 The mantle of this nudibranch is creamy-white with six irregular grayish translucent patches interconnected with other elongate translucent patches around the inner part of the mantle skirt. C. aureopurpurea : Was found in West Pacific. 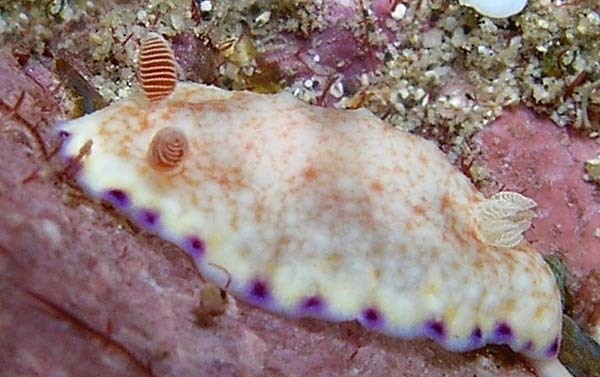 The gills are translucent purple or red-brown, and each marginal purple spot has a yellow cap around its inside edge, not a diffuse submarginal band of milky yellow. 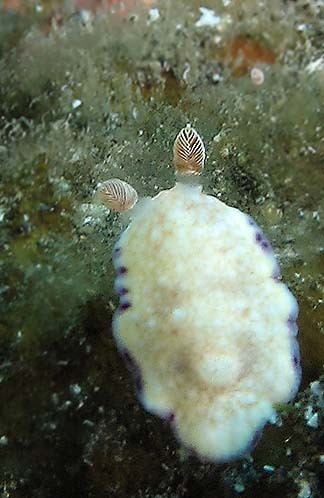 C. rufomaculata : Was found in Western Pacific. The golden yellow spots are slightly raised and usually on the white background pigmentation. Rudman, W.B. 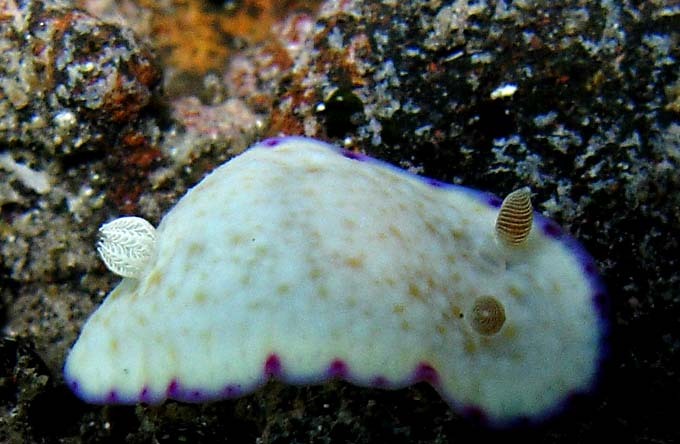 (1987) The Chromodorididae (Opisthobranchia: Mollusca) of the Indo-West Pacific: Chromodoris epicuria, C. aureopurpurea, C. annulata, C. coi and Risbecia tryoni colour groups. Zoological Journal of the Linnean Society, 90 : 305-407. Reunion, Etang salé on the rocky coast, less 1 m, 26 November 2005, size : 10-12 mm. Reunion, Etang salé on the rocky coast, less 1 m, 29 October 2005, size : 15 mm. 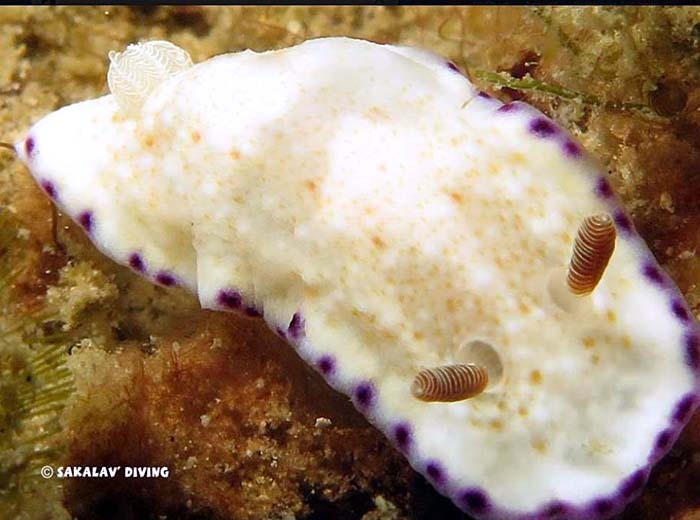 The gills sit in a spherical ball, which also called a goblet-shape in this nudibranch. Reunion, "Petit tombant" at Etang salé, 7m, 10 October 2007, size : 20 mm.